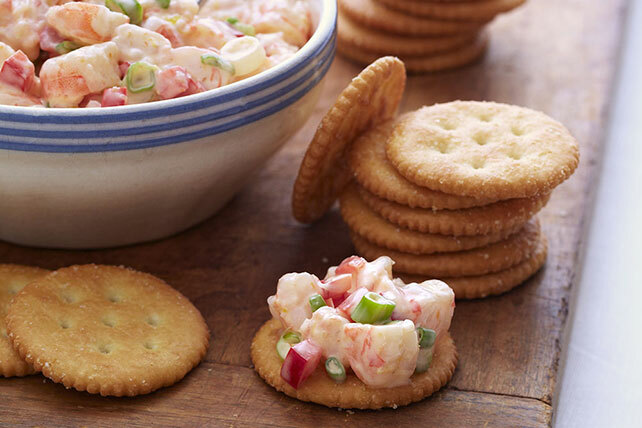 Creamy shrimp salad makes an elegant topping for buttery crackers. They're the perfect party hors d'oeuvres idea. Mix mayo, dry seasonings, lemon zest and lemon juice in medium bowl until blended. Add shrimp and vegetables; mix lightly. Spoon shrimp mixture onto crackers just before serving, adding about 1 Tbsp. shrimp mixture to each cracker. In addition to serving the shrimp salad on crackers, you can also serve it spooned into hollowed-out cucumber slices.